Well, hello there. Long time no see. How ya’ll been doin’? Thanks to my sister’s neighbor, Pam, I have been motivated to catch you up on the goins’ on over the past 10 or so days. 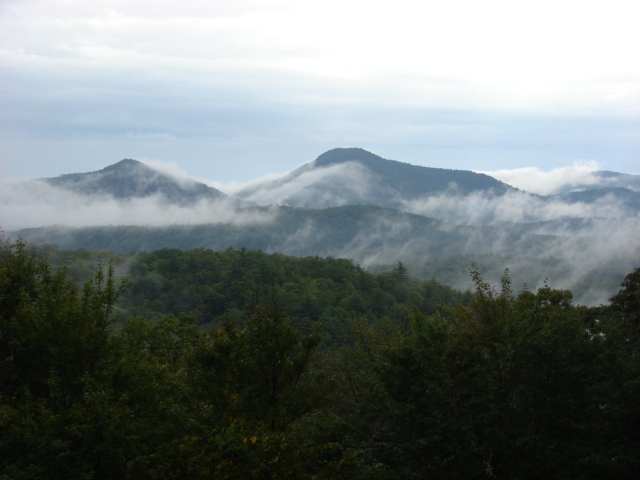 Let’s see, after I left the Great Smokey Mountains, I headed about 30 miles east to Clyde, NC and Skyland Camp for Girls, my childhood summer camp. 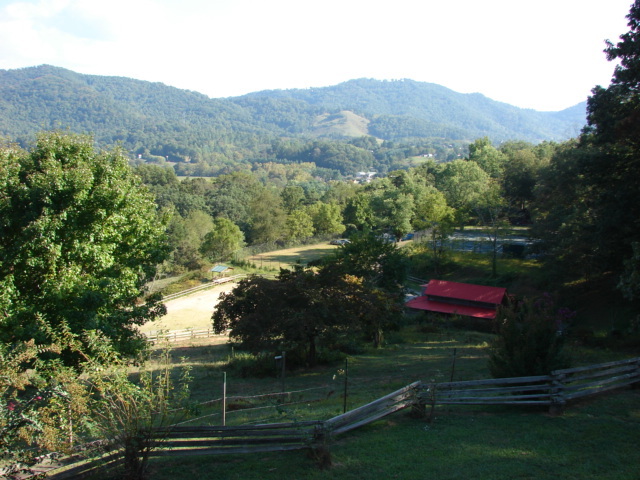 Sing with me, “On a hill not far from Clyde – You could find it if you tried – Lots of girls in green and white – Sing camp songs on Sunday nights…” What wonderful memories I have of those many summers on Skyland Hill. I was 12 years old my first summer there and kept going every summer, moving from camper to Counselor In Training to Counselor along the way until I was 20 years old. Go Big Tro! 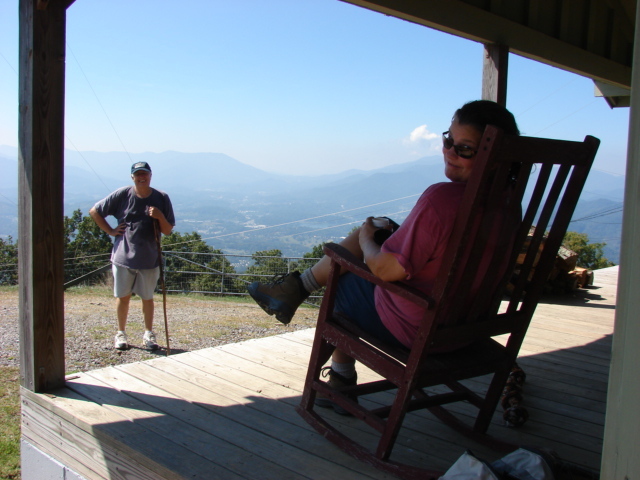 Here’s a shot from the Chalet overlooking the upper portion of the camp. You can see the barn, the riding ring, and if you look closely, you may be able to make out the tennis courts in the trees just above the barn. Skyland was founded in 1917 and has been run by the same family ever since. If anyone is interested in learning more, you can visit their website at www.skylandcamp.com. Here is a shot of the now retired Director, Bunny Brown alongside Mark Rathbone, a well-respected local man without whom Skyland Camp as we know it would not have been possible. The donkey is Mark’s friend, Jake. I wasn’t introduced to the cow, so can’t tell you her name. While staying with Bunny at Skyland for a few days, I got Dora all lined up to have her compartment door repaired and visited with an old camp friend, Suzanne Hoover Klimek, who now lives nearby. This is Suzanne rocking on top of Chambers Mountain after our hike up with her husband Alan in the background. Everyone say hi to Hoover and Alan! It took a few days to get organized after driving the 5,810 miles it took to get from Anchorage to Clyde, so I didn’t get down to my parents house until this past Monday, but here I am now in Cashiers (pronounced CASH-urs), in the far southwestern corner of NC. My family has a long history of spending summers in this neck of the woods too, so I’ve been enjoying being here again. This is a shot of the view from my parents porch. That is Rock Mountain on the left and Chimney Top on the right. 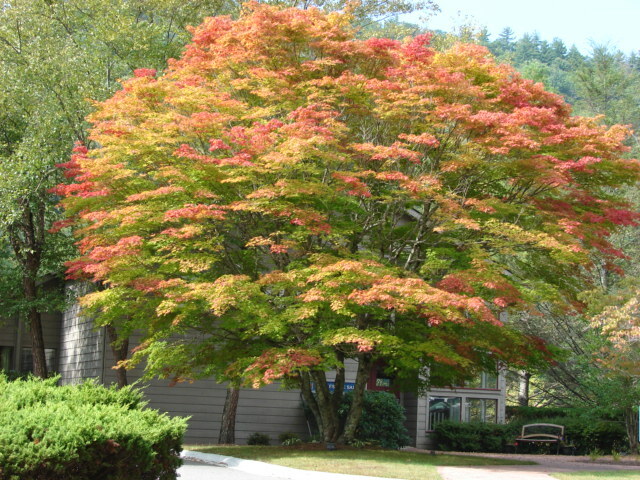 The leaves are beginning to turn on the sugar maples. This is the High Hampton Inn. When I was a young child, my family drove up here for summer vacations to escape the Florida heat as did my Mother and my Mother’s Mother before her. 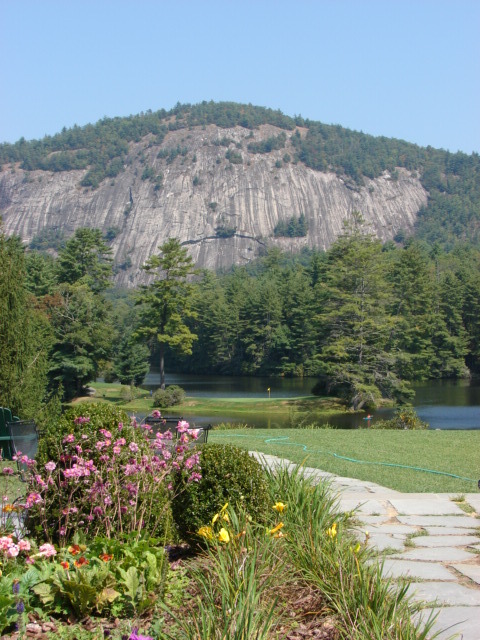 This is the view across the lake to Rock Mountain as seen from the Inn. This section of the lake was developed for swimming, boating, fishing, etc. I remember sitting around here fishing with a hand line. In my case, a hand line consisted of a stick with a length of white string tied to it. My Dad tied a safety-pin to the end of the string to serve as a hook, and I used a single corn nibblet as bait. No, I never caught anything, but at age 6, I sure had fun trying. 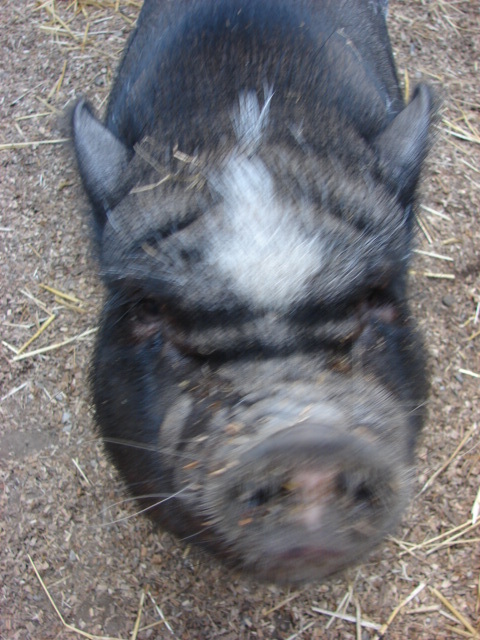 And finally, this is Biscuit, the resident pot-bellied pig at the local Farmer’s Market. That’s it for now. Dora is supposed to be ready for pick up tomorrow, if so, my parents and I will drive up to Clyde to get her. They haven’t met her yet and are anxious to do so. What fun. I love showing Dora to interested parties. Oh, and for those of you wondering about my finances, I have a job interview set up in Charlotte for October 4th. Hopefully, I’ll be a revenue generating traveling salesman shortly after that. I’ll keep you posted, so stay tuned. Fun to see your photos! Say hi to your parents for me and thank your mom for the article she sent (actually I will email her). Good luck with your interview. I’m curious what the job is? I went to see Colin Beavan (“No Impact Man”) speak at UNCW the other night. He was very interesting…not a great speaker but he is a “writer”. He had a great message for the students about doing something with their lives that makes a difference. “No Impact Man”is the common reading book for UNCW this year. I only brought this up because I remember you writing about it in one of your previous blogs. Keep us posted on your travels! FANTASTIC, as always! Absolutely LOVE the wonderful pictures!! Thanks, Merge! 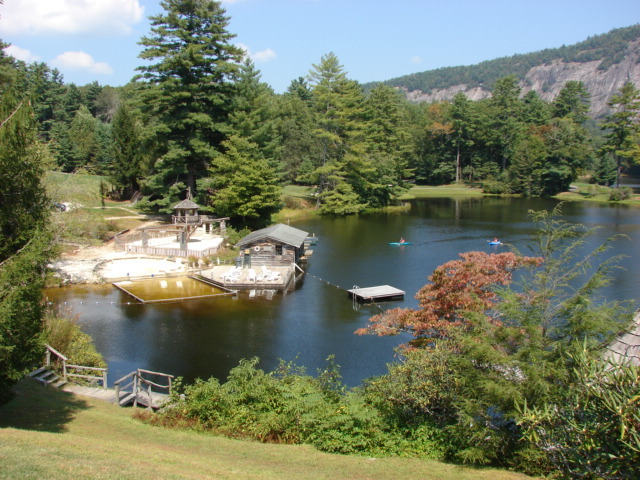 brought back my memories of my summers at Pocahontas Girl Scout camp in Virginia–probably not on the same par as Skyland Camp but I still remember how cold the lake water was, and we had to swim every day–who would guess that 60 years later, I would be choosing to swim 3X a week . Love the NC photos—especially being a Tar Heel graduate. You’re in my old stomping grounds now–did I say what year I graduated?? 1962! Yes, did wonder what is happening with you as I was so disappointed we didn’t get to at least say hello when you drove through Knoxville. We were literally running out the door for dinner before a staged performance of AMADEUS at U of TN. Today, thought about you when we by-passed Asheville en route home from a week at Pine Knoll Shores but your post with pictures filled in the gaps. I cherished every word as I too spent my summers near Clyde at Camp Merrie-Woode and my granddaughter followed your steps from camper to counselor from age ten to twenty. And……….HIGH HAMPTON INN was where I spent the night with family before camp since we had to drive from Eastern NC. I learned later that they spent the following week at the Inn so they would be near by in case my cousin and I became home sick our first year as compers!!! When Merrie-Woode celebrated the 75th Anniversary, we enjoyed the weekend with our Raleigh family at HIGH HAMPTON INN and always try to get there for a few days each year. I am eager to hear about the possible Charlotte job!!! Our son works for BANK OF AMERICA and lives there with his family if you need a “connection.” He is 45 and A LOT older than you!!!! Keep the pictures and descriptions coming!!! Good to hear from you again. 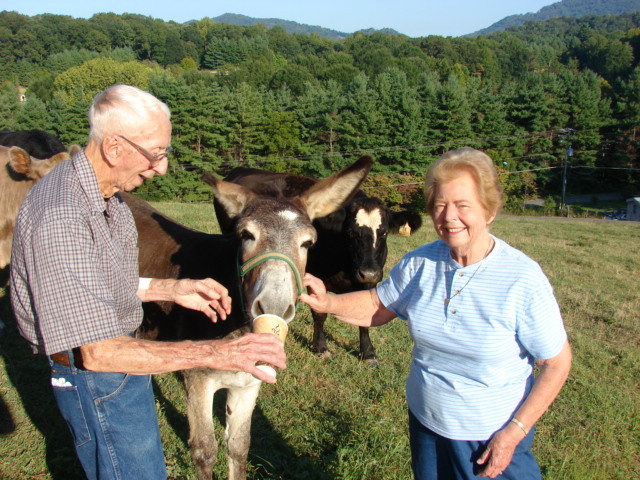 I love your recall of your life story and the pictures that go with it. Are you sure your name is not “Baby” and you starred in a movie where you learned to dirty dance? Thanks for getting us caught up with your whereabouts. Talk with you soon. Crack me up! 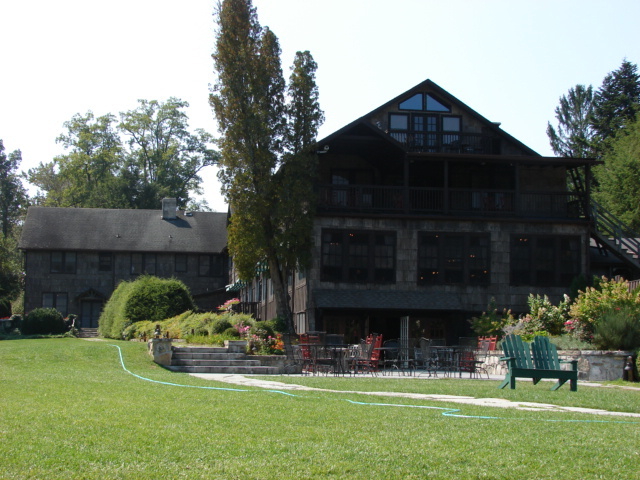 I almost wrote a line or two about High Hampton being like the place featured in Dirty Dancing, but changed my mind. Too funny that you would make the same connection. Nobody puts Baby in a corner! Hey Margie! I finally just got caught up on your postings. I can’t believe how far behind I’d gotten. I hope all is going well for you and the hounddogs in NC! I love the pictures of the area; that camp looks so awesome! Now that I’m caught up, I’m looking forward to more news of your awesome adventure. Take care!